Perfect positioning of the implant is a decisive factor when it comes to longterm successes. This is determined not only by bone structure, but also by the fact that no roots or nerves get hurt. Profoundness and positioning of the implant have to be exact in order to fit in smoothly the corona, bridge or prostheses. Average x-ray images usually do not give enough information. This is where computer-aided threedimensional implant planning technology comes in. The necessary distance to sensitive nerval structure and optimal profoundness of the implant are calculated exactly. 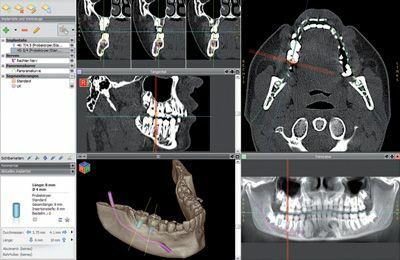 A special software allows a threedimensional planning on the screen and fulfils all the conditions to inserting the implant safer and preciser. This is done through patterns which are made on the basis of 3D design. Also the aesthetical factor can be considered completetly before the intervention thanks to 3D design.